TMINUS016 comes to us from an up-and-coming DJ/Producer from Glasgow, Chris Craig... who delivers two solid slabs of driving Techno; backed by remixes from the highly in-demand Scotland native Stevie Wilson, another rising artist and Scot in Nico Kohler, and Terminus Audio label boss Jason Mills. This year has seen Chris releasing original music and remixes on a few different labels, and now he sets out to make a statement with this effective and well-rounded EP on Terminus Audio. Welcome to Chris Craig's 'Concealed/Descent EP'. The EP begins with 'Descent', an upbeat but twisted Techno track with an unusual arp synth line and industrial-like effects serving as the front runners while a fat and chunky kick and snare combination anchor the piece. Plenty of quick edits and scathing sweeps keep things interesting for peak time. Definitely a welcome addition to any collection of those who like middle-of-the-road heavy Techno. Next is the hot and widely supported DJ/Producer Stevie Wilson up to bat with his punchy and well-produced take on the track. Stevie's rendition is a little moodier and darker, and makes for an excellent transitional track in your sets. You will definitely find yourself coming back to this one. 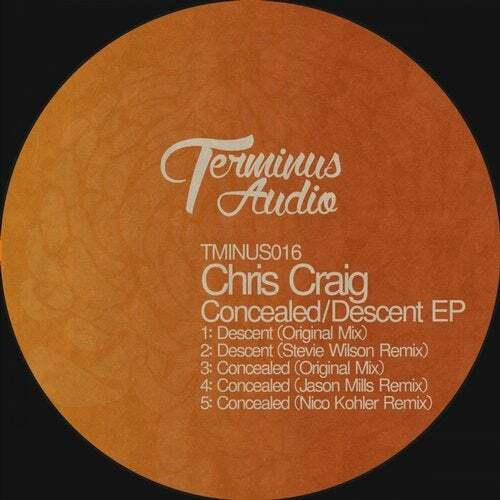 'Concealed' is Chris Craig's second original work on the EP; and is an unapologetic Techno stormer. Chris keeps the pressure in this tune on with a swirling, plucking, bass stab accentuated by a cool snare drum/clap pattern and a massive lead. Great to heat things up. Terminus Audio label boss and United States-based DJ/Producer Jason Mills takes a completely different approach with his remix of 'Concealed'; which is an ambitious percussive work out with huge drops and outrageous effects. One for the more daring DJ's and a fun record to play. Finally, on-the-rise producer and quickly becoming veteran remixer Nico Kohler finishes the EP with his dark and dialed-in take on the track. Nico makes full use of the arpeggiated synth from the original in this slick and sinister remix that will surely find a place in sets this Fall. We look forward to hearing more work from Chris Craig in the future! A nice entry here from the UK connection. Where in the world will Terminus Audio wind up next?